The bustle of traffic and people on the Jagannath Shankar Sheth Road,near Charni Road station, dies as soon as you enter the by-lane towards Khotachi Wadi. The lane leads one along colourful graffiti-lined walls to several charming Portugese-style bungalows. 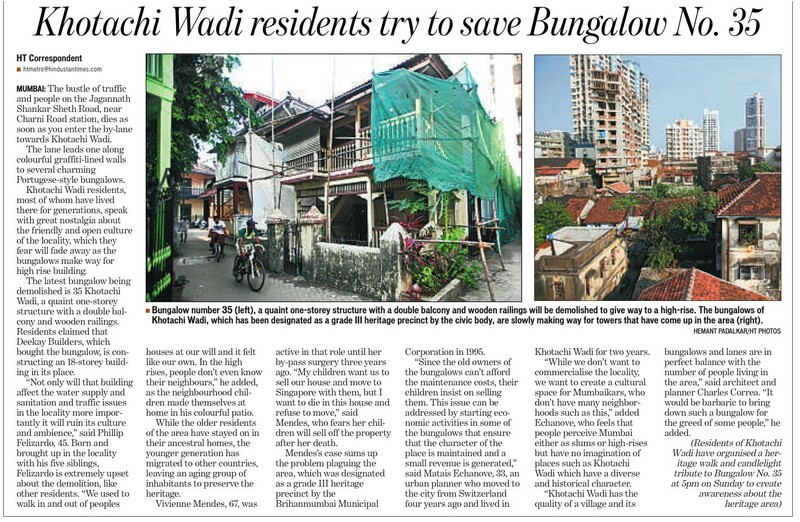 Khotachi Wadi residents, most of whom have lived there for generations, speak with great nostalgia about the friendly and open culture of the locality, which they fear will fade away as the bungalows make way for highrise building. The latest bungalow being demolished is 35 Khotachi Wadi, aquaint one-storey structurewith adouble balcony and wooden railings. Residents claimed that Deekay Builders, which bought the bungalow, is constructing an 18-storey building in its place. “Not only will that building affect the water supply and sanitation and traffic issues in the locality more importantly it will ruin its culture and ambience,” said Phillip Felizardo, 45. Born and brought up in the locality with his five siblings, Felizardo is extremely upset about the demolition, like other residents. “We used to walk in and out of peoples houses at our will and it felt like our own. In the high rises, people don’t even know their neighbours,” he added, as the neighbourhood children made themselves at home in his colourful patio. While the older residents of the area have stayed on in their ancestral homes, the younger generation has migrated to other countries, leaving an aging group of inhabitants to preserve the heritage. Vivienne Mendes, 67,was active in that role until her by-pass surgery three years ago. “My children want us to sell our house and move to Singapore with them, but I want to die in this house and refuse to move,” said Mendes, who fears her children will sell off the property after her death. Mendes’s case sums up the problem plaguing the area, which was designated as a grade III heritage precinct by the Brihanmumbai Municipal Corporation in 1995. “Since the old owners of the bungalows can’t afford the maintenance costs, their children insist on selling them. This issue can be addressed by starting economic activities in some of the bungalows that ensure that the character of the place is maintained and a small revenue is generated,” said Matias Echanove, 33, an urban planner who moved to the city from Switzerland four years ago and lived in Khotachi Wadi for two years. “While we don’t want to commercialise the locality, we want to create a cultural space for Mumbaikars, who don’t have many neighborhoods such as this,” added Echanove, who feels that people perceive Mumbai either as slums or high-rises but have no imagination of places such as Khotachi Wadi which have a diverse and historical character. “Khotachi Wadi has the quality of a village and its bungalows and lanes are in perfect balance with the number of people living in the area,” said architect and planner Charles Correa. “It would be barbaric to bring down such a bungalow for the greed of some people,” he added.